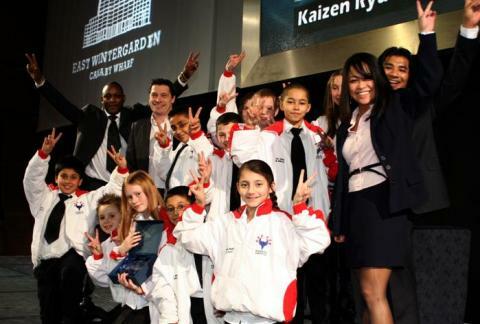 The Kaizen Ryu National Squad was formed in October 2006. It's squad members train regularly on top of their regular training schedule and have come on a long way since then. They have competed at Club, National and International Level. From Crystal Palace, to Kent, Essex, Aylesbury, Manchester, Germany and even to Japan. Their efforts and passion for the sport in and out of the competition arena has recently been getting noticed by top people and getting results at top level. Incredible achievements from young people who are rapidly becoming positive role models in their communities. If you want to be considered and be part of this exciting team, please contact Marie or Indy or submit an online enquiry using the web-form. May 2010 - Vicky's Living the Dream! Congratulations to Vicky Phillips, who has recently been awarded a financial support towards her trip to the FSKA World Championships in Poland later in the year. 'Living the Dream' Barking and Dagenham Trust, have generously given their support to help young athletes like Vicky "live their dream" of being part of the London 2012 Olympics and other international competition, and help them develop their sporting talent. We are pleased to announce that this year, Canary Wharf Group has agreed to support the team of new sponsored kit and equipment, ready for the World Championships this year in Japan and Poland. March 2010 - "SPORT FOUNDATION PROVIDES 800 WAYS TO HELP 2012 AND 2016 HOPEFULS"
Congratulations to members of the Yudansha squad, who have this year been selected to receive the GSF Regional & Potential Award which includes a Training Membership for free use of any GLL managed sports or leisure facility up until 31st March 2011. In addition to this, young athlete Tyrone Briscoe also received financial support of up to £250 towards training and competition related costs. "Over 800 young athletes from across London and the South East have been awarded financial and training grants worth over £400,000, from the GLL Sport Foundation, making it one of the largest independent athlete talent support schemes in the region. The successful applicants were announced at a VIP event held at the landmark BT Tower in Central London on 16th March 2010. Sally Gunnell Patron of the GLL Sport Foundation made the announcement, accompanied by the Foundation's Paralympic Ambassador, Alexandra Rickman and SportsAid Board Member Chris Baillieu."